Mentioned below are the various factors of soils and ground conditions that would affect the depth of the foundation. The depth of the foundation is highly affected by the allowable bearing capacity of the soil. This will decide the need soil improvement or increase in depth of foundation. If the site is more off clay, it is important to identify the zone where the shrinkage and the swelling of the particles takes place as a result of seasonal weather changes. These change in clay material are caused by trees or the shrubs located nearby. Hence the penetration of the foundation has to be performed below this critical zone. In sites with fine sand and silts, there are chances of frost action happening at a particular zone. Foundation constructed must penetrate below this zone. The maximum depth of scouring must be considered during the foundation construction of structures like bridges and piers. Hence the foundation depth must be below this scouring depth. By means of an incompressible fill material like gravel and sand. Here the width of filling must be greater than the width of the foundation for load dispersion from either side of the foundation base. Below mentioned are recommendations for foundation construction under different ground conditions and soil types. As shown in the figure below, a line drawn at an angle of 30 degrees with the footing base must be parallel to the slope of the ground i.e. these lines must not intersect with each other. When a new footing has to be constructed near to an old footing, the width of the wider footing (w) is taken. The distance maintained during the construction of new footing with the old one is this width ‘w’. Based on the severity of the project, analysis of the bearing capacities and the settlement can be performed. 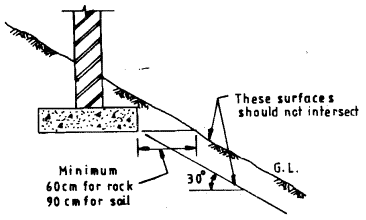 The figure-2 below shows the construction of footing at different levels on granular soils. 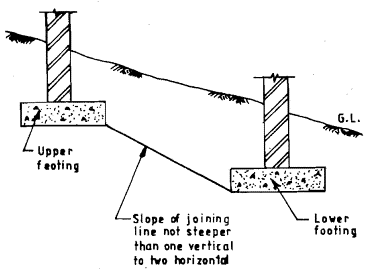 As shown in figure, while constructing the footing at different level, it is recommended that the line joining the lower adjacent edges of the footing must not have a slope that is steeper than ½ (1 vertical to 2 horizontal). 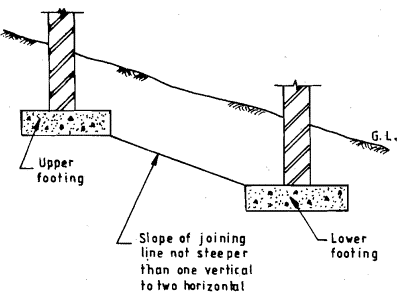 While constructing footing at different levels over clayey soil, the line drawn between the adjacent edges of the footing as shown in figure-3 below must not be steeper than ½ ( One vertical and 2 horizontal).